I started Finch Song the other day. I decided to go with the linen that came in the kit (French Vanilla by R&R) after all. The Lt. Examplar was a little too dark for some of the thread colors. I have some more dk green silk to finish "The Riddle," so I guess I really should get back to it. I'm just loving "Finch Song" right now, so it may have wait a while. :) Write soon! Sorry Nicole, I had a typo on my first post and deleted it. Your Finch Song is so pretty and I agree, the fabric you chose is so lovely and looks wonderful! I love your Plum Street Sampler A Sweeter Love with all of those yummy colors! 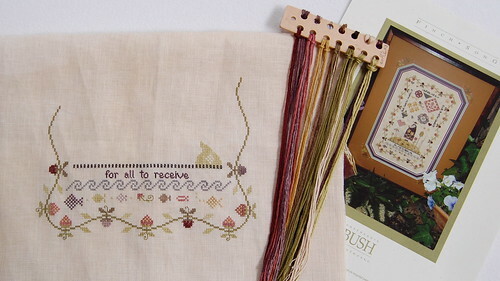 You have lots to keep you really interested in stitching! Very pretty!! i still can't get over how fast a stitcher you are girl! Finch Song is looking great already! and can't wait to see the rest of the Riddle! Finch Song is beautiful. I'm gonna try to control myself and not rush out to buy it. I've been noticing that you're a bottom-to-top stitcher sometimes, and a top-to-bottom stitcher other times. I'm so left-brained that I never thought of starting at the bottom. Looks like it could be fun. Those are such pretties projects! And wow, you go fast with your needles. I love your new start on Finch Song! You are such a fast stitcher. I'm so jealous of all your projects. I like Cindy's lettering too and use it almost exclusively now. Oh man, now I really want to start mine too! You are a bad influence ;-). Love the floss toss on the other piece too. I think I would be interested in the SAL. A Sweeter Love is one that is on my list (all of Paulette's are). Keep me posted, please! Very pretty progress on Finch Song, Nicole! The colors are so pretty! Your blog is always a feast for the eyes! Finch Song is beautiful; can't wait to see more! Finch Song is so pretty! I will be looking forward to each installment but since you stitch so fast, it may only be 1 or 2 more before you're done! Isn't your Finch Song so pretty! I'm glad you went with the fabric you did as the colors look great on it. Oooo - all those pretty NPIs! Looking forward to that start, too! The SB kit is just beautiful-your stitching is coming along quickly! I've not seen that kit yet. Finch Song is such a lovely design. Oh, well another to add to the wishlist! Great start - you are such a fast stitcher! 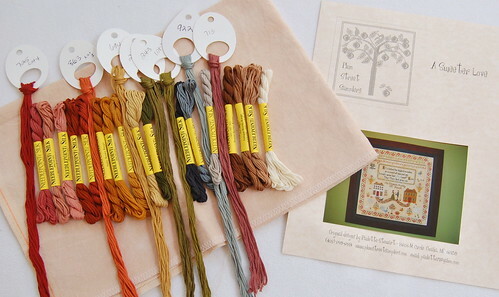 Love your new start and I agree with the choice of sticking with the French Vanilla linen, the colours are beautiful. I am in love just looking at the pic of the floss toss for your SAL, be still my heart! I look forward to seeing your next update. Sorry about the spelling error. I wasn't trying to come up with a new word. Gorgepus could become a new word though - has a good ring to it (and a little funny!). Sorry, I'll go now.